On this last day of July, the month of the Precious Blood, let us turn from our meditations on the Eucharist to consider Confession, the sacrament of Penance. Each of the sacraments has multiple names. These names are not interchangeable, but each reveal a different aspect of the sacrament. The sacrament we are considering now is called Reconciliation, because that is its end, what it brings about. It is also called Confession, because that is its means, the thing we do. But a third name for it is the Sacrament of Penance, because that is its inner nature: what Confession consecrates, and what brings about Reconciliation. The word penance is a rich inheritance from our Latin Catholic tradition. The Greek in which the New Testament was written uses the word metanoia, which means essentially a change of mind, or conversion. “Conversion” literally means “turning around,” and that is another important name for the sacrament of Penance. It is about changing our direction. The Latin tradition expresses a key insight into conversion with the word poenitentia, penance, or repentance. The root word is poena, which is pain, or punishment. That sounds ugly at first, but the point is that conversion really does involve change. Conversion would be painless if we were not set in a certain direction. Some of the shallowest modern philosophy (with roots, really, in a certain kind of Protestantism) pretends that each moment is completely unconnected with the moment before, so that we can painlessly make a complete about-face. But that is not what it’s like to be a human person. We are more steady than that. We set our heart on things. (That’s what the whole business about “kidneys” refers to.) To give up on one way of life and begin another is painful. Put it this way: there is no such person as Ebenezer Scrooge. One night, Scrooge changes his mind, and wakes up in the morning a radically different person. But that’s not what it’s like for us. If you have had your heart set on riches – or on anything else – it hurts to turn away from that. In fact, this is something profoundly healthy about us: we do have hearts which get set on things. We do get attached. And we are supposed to get attached: that’s what our passions are for. But that’s also why change hurts. You may know that Dickens’s A Christmas Carol is a reworking of Dante’s Divine Comedy. The difference, though, is that in the Catholic view, which is so much more human, it’s hard to change: that’s what Purgatory is all about. In fact, it’s what the Inferno is all about. Or put it another way: it wouldn’t be a real change if our hearts weren’t really set on something. Painless metanoia is not really any change at all. Jesus enters into the pain of our conversion. Luke portrays this vividly with the story of the good thief. “Do you not fear God,” he says to the other thief, “seeing that you are under the same condemnation? And we indeed justly; for we receive the due reward of our deeds; but this man has done nothing wrong” (Lk 23:40-41). The good thief joins Jesus in Paradise because he accepts the pain of conversion. He recognizes the evil of his sin, and he literally feels the pain of conversion. Punishment, you see, is not meant for the glee of the punisher. It is meant to give us an opportunity to acknowledge the evil of our turning away from God, and experience what it is like to turn back. Jesus joins us in that penance. It is not so much that Simon the Cyrenean helps Jesus carry the cross. Rather “on him they laid the cross, so that he might carry it after Jesus” (Lk 23:26): Jesus walks the way of penance with us. It is he who gives us the strength to carry the cross. In Confession, the priest has the power not only to “loose” us from our sins, but to “bind” us, by giving some penance, some cross of conversion, bound to Christ, that will help us walk the way of real personal change. “They have washed their robes, and made them white in the blood of the Lamb” (Rev 7:14). The path to true conversion is by bathing in the Precious Blood of Jesus. Are there crosses of conversion you are unwilling to carry? Bathe them in the blood of the Lamb! Click here for the entire series on the Precious Blood. In this month of meditation on the Precious Blood, we pause to consider the sacrificial aspect of the Mass. Now, this is an interesting way to approach the Eucharist. Because notice, we are asking the Lord to accept the Body and Blood of Christ the same way he accepted Abel’s plain old lamb, Abraham’s sacrifice (of Isaac? he made other sacrifices as well – but not of the Body and Blood of Christ), and Melchizedek’s just plain bread and wine. If we look at the thing being offered, it’s as if we’re asking God to treat what we have on the altar as if it were something less. Our offering is better than theirs. It is odd, too, that we ask him to “accept” what is obviously acceptable. Why do we need to say this kind of thing? The reason is because we’re not talking about what’s on the altar, the victim. We’re talking about what’s in our hearts, as we make our priestly offering. See, what is on the altar is important precisely because of the way it relates to our hearts as we offer it. We want to offer not the things Abel, Abraham, and Melchizedek offered – we have something better. We want to offer the way they offered. The deeper point is that they used what was on the altar to honor God, to acknowledge him, to give him thanks. That’s the true meaning of sacrifice. That’s why, even before the gifts are consecrated, the Roman Canon says, “accept and bless these gifts, these offerings, these holy and unblemished sacrifices.” Even before what is on the altar becomes the Body and Blood of Christ, we are already talking about what we are doing with our hearts. Now, the greatly abbreviated Eucharistic Prayers given to us after the Council (most priests use Prayers II and III almost exclusively) don’t talk about this as clearly. But it’s still there – in fact, it’s still the heart of what’s going on in the Eucharist. In the offertory, the priest says, “we have this bread to offer.” Not “to eat,” not just “to receive.” We are going to do something – to give thanks by offering. We then pray, “May the Lord accept the sacrifice at your hands.” What is in the hands of the priest is our prayer of thanksgiving. In Eucharistic Prayer II, the priest begins, “Make holy, therefore, these gifts.” Well, the translation doesn’t make clear who is giving gifts to whom. Certainly God gives the Eucharist to us. But we also give it to him: “gifts” is sacrificial language. This comes out in the acclamation, when we say, “we proclaim your death.” That’s what we’re doing with the Body and Blood on the altar. Not just receiving, but proclaiming, offering, giving thanks. And thus in the “anamnesis,” the priest’s prayer right after the consecration, he says, “as we celebrate the memorial of his Death and Resurrection, we offer you, Lord, the Bread of life and the Chalice of salvation, giving thanks.” We offer the Eucharist to him! And we give thanks “that you have held us worthy to be in your presence and minister to you” – again, in Latin, this is explicitly sacrificial language. We are doing something! “Look, we pray, upon the oblation of your Church, and recognizing the sacrificial Victim.” The Latin verb for “offer” is irregular: oblation and offering are the exact same word in Latin. Both of them are about sacrifice: we life up a sacrifice to God. How could you remind yourself to lift up the Sacred Victim as your sacrifice of praise? How could you be like Abel, Abraham, and Melchizedek? One of the goals of the liturgical reform after Vatican II was to simplify the calendar so that we could enter more deeply into the liturgical seasons themselves. This past Sunday is an example of the challenge: Peter and Paul is a really big, important feast, one they decided to keep; but this year it overran a Sunday, when we’d like to be doing our orderly/”ordinary” reading through the Gospel. This is always a balancing act – they did the same thing after the Council of Trent, because there’s always a temptation to keep adding more and more things. Perhaps you’ve experienced this with the end of the rosary? You add the Litany of Loretto, then the Prayer to St. Michael, then invocations to the Sacred Heart, and then prayers for the Pope, and while you’re at it you add your ever-longer list of people to pray for, and maybe a spiritual communion . . . and eventually it gets out of control, and you have to pare things back. It’s not that any of these things aren’t good. It’s just that there are only so many hours in the day, and when we add too many things, we end up rushing through all of them. Like a hair cut, it always takes a little growing back after these prunings to get everything right again. But no one intended the 1970 Missal to remain unchanged forever. We now celebrate Corpus Christi as the Solemnity of the Most Holy Body and Blood, but that used to be divided into two feasts. No matter when Pentecost falls, July 1 is after the great Thursday celebration of Corpus Christi – I think June 29 is the latest Sacred Heart can fall. And July 1 starts a new month, which is traditionally associated with meditation on the Blood of Christ. In Scripture, both blood and wine have an interesting dual association: both life and death. Blood is the very stuff of life, even the word for kinship: those who share your blood (e.g. Prov 1:18). The Israelites are prohibited from eating blood precisely because it is like eating something still alive: “You shall eat blood of no manner of flesh: for the life of all flesh is the blood thereof” (e.g. Lev 17:14; 17:11). But when blood is seen, it’s a bad sign, and most of the uses of “blood” in the Bible are for “bloodshed.” There’s something very visceral here. Even my little children know that when they see blood, it’s like death is near. Imagine the drama of the Last Supper. 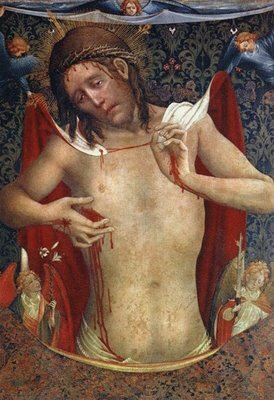 Jesus says, “This is my body.” And thus far the Apostles might have said, “strange, but okay.” But then he says, “This is my blood, which will be shed.” Oh no! The blood is the sign of death – precisely because it is life, separated from the body. It is in fact central to the traditional reading of Eucharistic symbolism that the distinction of Body and Blood manifests Christ dead. His Blood in the chalice means it is not in his Body. The Old Testament actually uses “blood” (the Hebrew word dam) as a word for wine: “you drank the pure blood of the grape.” And wine too has this double association. On the one hand, it is “wine that maketh glad the heart of man” (Ps 104:15; cf. Eccl 9:7, 10:19, Song 1:2, 1:4, 4:10, 5:1, etc.). But it is also “the wine of astonishment” (Ps 60:3) and “the wine of violence” (Prov 4:17). “Wine is a mocker, strong drink is raging” (Prov 20:1) – in fact, often the line is “wine with mixture,” which refers to a stronger, more alcoholic beverage. A little brings joy; a lot brings stumbling. It is, perhaps, like having too much life in you, more spirit than we can handle. Jesus gives us his blood as wine. He pours out his life. And it is his own death, his own loss of blood, that is our life. We come to life by entering into his death, drinking from his death. We enter the inebriation of death, and discover the joy of Jesus. And all of this flows, of course, from the wound in his Sacred Heart. How could you practice devotion to the Precious Blood of Jesus this July?